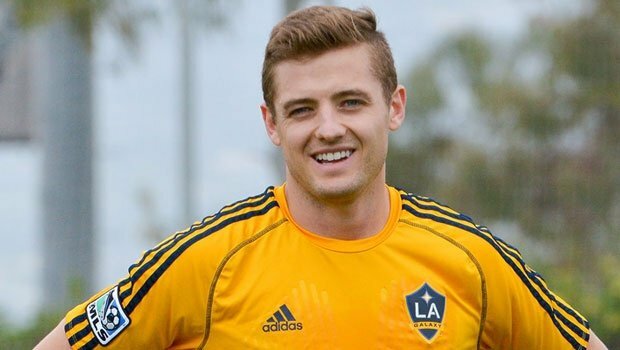 Ever since Robbie Rogers came out in early 2013, the soccer player has been intent on changing sports culture the best way he knows how – by being himself. Rogers shares his story in Coming Out to Play, a book co-written with Eric Marcus (Breaking the Surface, co-authored with Greg Louganis) on the LA Galaxy player’s journey from closeted Catholic to barrier breaker. The first openly gay male athlete to win a big-time team pro sports title in the U.S., Rogers talks being “sad” about the lack of out athletes, homophobia in sports and how stories on LGBT-focused locker room behavior set the gay community back. What was the most rewarding thing you learned about yourself while writing this book? I learned a lot about myself writing this, but I don’t know what the most rewarding is. When I wrote about my childhood, and just talking about how closeted I was, how things really scarred me and, obviously, being very afraid to be open with people, I think I learned from all that that I needed to be more open with people and learn from all those experiences. Without working through all those stories and writing all that down, I don’t think I would’ve been as aware of it. So, while I was writing the book, I realized, “Gosh, I need to share things more often with people and talk about things and be open,” which doesn’t come naturally to me. I’m a very shy, quiet person, actually. The most rewarding thing for myself, I think, was to just realize that and try to work on it during this past year, and to continue to work on it. In the book’s prologue, you say, “I’ve been uncomfortable with the shorthand versions of my life that I’ve seen and read.” What do you hope to clarify? There’s an assumption that men’s sports are not welcoming to LGBT athletes, or even threatened by them. Is this due to the fact that people didn’t know what would happen until someone came out? Yeah, that’s the big thing: People don’t know what’s gonna happen. People are afraid, obviously, that things might change for them. I don’t necessarily think that the majority of athletes are homophobic, but I think there’s that mentality in the locker room. From my experience, all the guys that I heard homophobic things from growing up were the first ones to call me, text me and support me [when I came out]. Athletes themselves are not homophobic; the sports culture is. As an out professional soccer player, people are sensitive. They know there’s a gay guy in their locker room and they’re not saying homophobic things. Instead, we’re discussing marriage equality. But when there isn’t an out soccer player – a guy that they know is gay – in the locker room, I’m sure things are being said that are homophobic. Again, I know it’s ridiculous for me to say, but it’s not necessarily because (players are) homophobic, but they’re not educated to be sensitive to what they’re saying. Someone might argue that that’s homophobic, but these guys are very loving and supportive of me, and I think if anyone in the locker room did come out, (other players) would be very supportive of them. But it’s that lack of knowledge and education about the LGBT community, and about mental health and just being sensitive to other people, that I think is the issue. ESPN recently reported on out NFL player Michael Sam’s showering habits, which they’ve since apologized for. What is your opinion on the media’s focus of locker room behavior as it pertains to gay athletes? It’s absolutely ridiculous. I know that with [NBA player] Jason [Collins] and I there were no issues, but I think sometimes ESPN or different media people get bored and create stories for controversy or attention. I think that was one of those. I’ve only spoken with Michael a few times, but I’m guessing his experience in the locker room was like Jason’s and mine, and that the guys were very supportive and proud to have an openly gay guy on their team who was changing things for the world. I haven’t really spoken to Michael about that much; I just know from my experience that’s the case, so, I mean, it’s ridiculous when people report that kind of stuff just to create a story to get comments on Yahoo or wherever else. That’s not gonna change things for the better. What if you were the topic of that report? What would you have thought of it then? Honestly? Laughable. I would just be like, “The locker room and my teammates and myself are on the same page and everything is cool. I enjoy being on the team, and I think they enjoy having me on the team.” It’s just laughable. Does this kind of reporting make you cautious about your locker room behavior? No. I’m the same as everyone else in that locker room. I shower with the guys. I walk around naked. My experience in the locker room is the same as everyone else, and I don’t think it’s any different for any of the guys. They don’t act any differently around me. It’s just normal. You said recently that you thought more athletes would come out after you did. No, not just me – but there’s Jason Collins, and there are female athletes who are out, and then Michael. There was a number of athletes, and there was stuff going on around the world. I just thought it was about time more athletes feel comfortable to do it. Maybe it just really shows how the sports culture is just not very accepting to gay men and women being out. Are you disappointed that more haven’t come out? No, I remember how difficult it was for me, so I’m not disappointed in that way. I’m just surprised. I know what it’s like being on the other side and being supported and having people that love me on my team, and I just think that everyone deserves that. If (closeted athletes) could somehow find a way to (be out), they would really have so much support. So, I’m a little sad and a little surprised that people aren’t willing to take that leap, but I’m not mad. It’s really difficult, and everyone has to come out at their own pace and at their own time, and I understand that. Do you know a lot of gay sports players who aren’t out? Uh, I know a few. I don’t think they’re ever gonna come out. I mean, maybe once they’re done playing, but I just think their lives – I’m not sure. That’s a good question. I don’t know. But I do know a few. Sometimes people have been living a certain way for a long time and are afraid to make a change. What coming out advice do you have for a closeted gay athlete? Speak with someone away from your team, your family and your friends – a therapist or someone – to just get those thoughts out. I know that when I kept it inside, it was not very healthy. That’s really the only advice I could give. It’s tough to give advice on that subject. When it comes to efforts being made for sports inclusivity, how far do we still have to go? I think there still needs to be progress, but I think the leagues are changing and the leagues want to have out athletes on their teams so that they can change that perception. But I think there needs to be a bit more work on changing sports culture, because they’re just waiting for athletes to come out, and I think, first, they need to create an environment that’s more accepting. You’re producing a comedy for ABC called Men in Shorts that’s supposedly based on your life. But after reading your book, your story isn’t particularly humorous. In fact, it’s dark, sometimes tragic, and ultimately inspiring. It sounds more like a premium cable drama to me. With that said, how will your life story translate into an ABC sitcom? The show, first off, is just inspired by my life. I have a huge family, and in the show there’s not a big family. And, yes, there’s a gay soccer player and he’s from LA, so there are a lot of similarities, but there are so many differences too. Really what I’m doing is helping the writers in creating characters that are realistic, like, (what it’s like the) first time taking showers with the guys or being open to talking about my boyfriend. We’re trying to teach people through laughter and through comedy, and also talk about the sports world, but from a different point of view, obviously. It’s a total fish-out-of-water concept. There are aspects taken from my life, but it’s not based on the book or based on the struggle that I went through. But there will be shower scenes? (Laughs) 100 percent shower scenes. I mean, it’s the locker room, so it has to be realistic! On Facebook recently, you posted a shirtless photo of you in bed with the book. How aware are you that some people aren’t just interested in you because of soccer? To be totally honest, yeah, I guess I’m starting to notice it more now. I mean, through social media. But when I’m out with friends at dinner or grabbing drinks and people come up to me, I’m oblivious to whether [people are] hitting on me or trying to be nice to me. Sometimes I can’t tell the difference! You say that you didn’t want to be the poster boy for gay athletes, but then you became that. How have you come to terms with being an accidental activist? I know I talk about it in my book, but I came out for selfish reasons – for my happiness. I realized I needed to make a change. My goal wasn’t to be this person that wanted to change sports culture; it was really just to be happy with myself and my family and friends. I didn’t know what the reaction was going to be, and I didn’t realize how big the problem was. When I realized how many people related to my story and struggled growing up, it made me feel ridiculous and selfish. I was seeing what kind of difference I was making in people’s lives. With the book out, I’ve been getting tons of letters from people writing me their story and [telling me] how much they relate to my book. It was those reactions that made me want to embrace that role more. You’ve obviously been instrumental in changing the tide for the LGBT community in many ways. How far do you plan on taking your newfound platform? Good question. At the moment, I’m just living every day as it comes. I don’t think of it that way – I just do what I feel is right. I just think of myself as Robbie. I play soccer, and yes, I’m gay. And I’m happy to be that person.